Late last July, after watching bearcam for a month, I got the itch to visit Brooks Camp where I had worked and lived for many summers. During an extended break from work recently, I spent a couple of nights camping there to binge watch bears. I had originally planned to spend three nights at Brooks Camp, but weather conditions conspired to alter my plans. 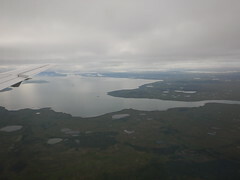 On September 3, during the final approach on my flight from Anchorage to King Salmon, I felt pangs of excitement and eagerness as I caught glimpses of Naknek Lake, Dumpling Mountain and much of the rest of western Katmai National Park. I arrived in King Salmon to mostly cloudy skies and a strong northeasterly wind. 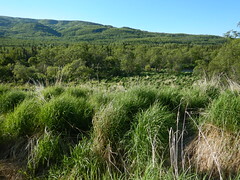 Situated at the head of the Alaska Peninsula, King Salmon and Katmai National Park often experience windy conditions, so I didn’t think much of it. After checking in with Katmai Air, I patiently waited to board one of their small floatplanes, which would take me the final thirty miles to Brooks Camp. The wind increased in strength as I waited for my flight. Travelling via plane, rail, or bus usually stimulates mild anxiety in me, not because I fear a crash but because I don’t want to deal with delays. 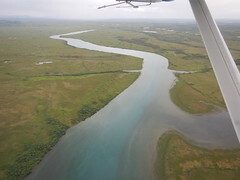 After the first Katmai Air flight left, I sat patiently for the plane to return so I could head to Brooks Camp. As it turned out, I would have to wait for nearly 24 more hours. About 45 minutes after it left, the Katmai Air Otter returned with the same passengers. When I saw them exit the plane, I knew the chances of reaching Brooks Camp were slim that day. A strong low pressure system centered over Kodiak Island brought gale force winds to the northern Alaska Peninsula on September 3, 2017. Rocks near Katmai Pass show signs of abrasion from blowing pumice. The strongest winds through the pass blow from south to north (right to left in the photo). 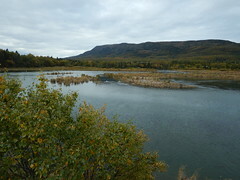 Although Brooks Camp and Brooks River lie at a much lower elevation than Katmai Pass, the area remains exposed to easterly winds driven through the Iliuk Arm of Naknek Lake. On my travel day, while conditions were never too windy to keep planes grounded in King Salmon, Brooks Camp was experiencing a gale. On September 3, 2017, the highest wind gust recorded at Brooks Camp was 60 miles per hour (97 kph) at 12:27 p.m.
Around noon, two hours after I was supposed to reach Brooks Camp, Katmai Air cancelled all day trips to Brooks River due to unsafe landing conditions and a lack of time. The faces of those on day trips expressed genuine disappointment. They left dejected. 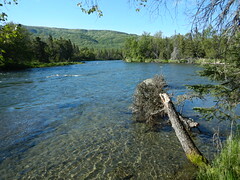 Knowing just how amazing Brooks River is, I don’t blame them. I felt my own bit of disappointment through the afternoon and evening. I would not reach Brooks Camp that day. I had two more nights planned, thankfully, so I could wait out the storm and reach Brooks Camp (I’ll chronicle my experience there in forthcoming post). While flights to and from Brooks Camp are occasionally delayed, it’s rare for them to be canceled due to weather. Every few years though, a strong windstorm prevents safe landings and departures on Naknek Lake and Lake Brooks. In 2009, 60 people, who had only planned to spend one day at Brooks Camp, were stranded due to strong winds. No one who knows the area well would ever say the weather there is benign. Sorry you got delayed but was finally able to make. I think it is an itch you will never get rid of. One you have been there you dream daily of being able to return. PennyinMt. It seems like weather-related delays are just part of the process of traveling to Brooks. I experienced it trying to get to Brooks, and leaving to get back to Anchorage. And I think everyone else I know who has traveled there this year has experienced some sort of delay. I couldn’t imagine trying to do a day trip to Brooks and the anxiety of trying to wait out weather delays knowing that your time at this amazing place is so limited. Thanks for whetting our appetite. Look forward to hearing about the rest of your trip! All I can say about your delay is UGH. Can’t do much about the weather. We were so fortunate that we had no delays to or from Brooks last September. Hope my luck holds out next season! So just curious when your plans have been altered by weather delays etc. are you reimbursed for the time lost? No, you are not reimbursed for delays due to weather although Katmai Air may have refunded the day trippers who didn’t make it to Brooks Camp, at least they were to told by staff at the Katmai Air dock to call ask about the possibility of a refund.